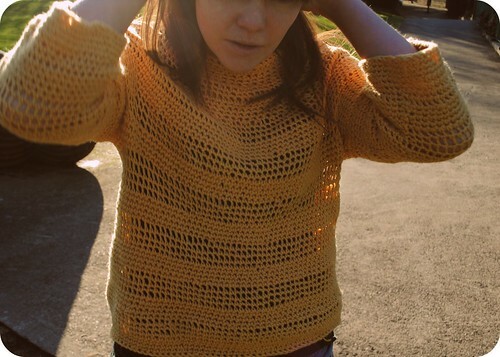 It's a loose fitting pullover, worked in the round, in one piece, with just the underarms to sew up at the end. I worked it like this because personally I hate getting to the end of all that lovely crochet only to have to sew up loads of seams (this is apparent when you look through my unfinished project pile!). I used Rowan pure wool 4ply, in the beautifully named 'gerbera'. I choose wool as it's January and I wanted something warm, I choose the colour because it's January and I needed something sunny in my life! 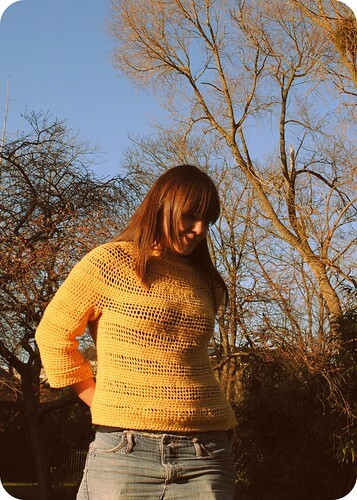 You certainly wouldn't need to use wool, in fact the weight of the sweater and the 3/4 length sleeves would make it a great summer jumper worked in cotton on linen. Though the yarn required is 4ply, the striped effect is created by doubling up the yarn for the darker sections and using a big hook for the lighter stripes, so if, like me, you usually avoid projects with slim yarn, through fear they'll take too long, don't worry, I promise this is a quick project (like I say mine took me 2 days). I may of course my be a little biased but I love this pattern! 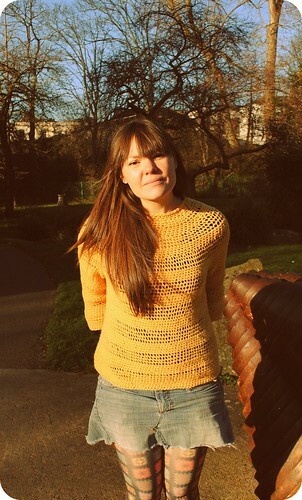 It was a joy to make and I've worn my sunny sweater everyday since it's completion (in fact it really is due a wash now!). My ravelry notes on this project here.